All CTS Composting Toilets are hand built to order. Each tank has baffle walls and air channels. Each composting toilet includes the CTS Easy Drain and a Heavy Duty Aluminum Access door. CTS Composting Toilets come with a complete venting system including a vent fan, vent pipe, roof flashing, storm collar, and vent cap. You can build your own Tank Support Cradle from our plans, or we can build the cradle for you. All systems are shipped with detailed Installation Instructions and Owner's Manual. Free sample floor plans are available with each system. Why the CTS Outback? There are several sites around America that have particular needs that the CTS Outback addresses. Sites may require low profile composting toilets due to high water tables, or high wind loads, or simply in keeping with the idea of not wanting to interrupt the natural landscape with a building. Rustic Outback experiences are enhanced by providing clean, environmentally correct composting toilets. Some sites require that the composting toilet be moved seasonally, the CTS Outback is small enough to move. Some sites require that during the off-season you "Leave No Trace" so the toilet and vent system can be removed and the low profile, partially buried, tank is practically out of sight. The Outback can be surrounded with natural privacy screens with very low impact. The CTS Outback is small enough to be dismantled and packed into the back country without requiring machinery. 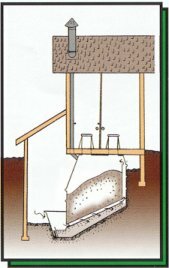 The CTS Outback provides a clean, environmentally safe alternative to the old pit latrine. The Outback is handmade using fiberglass & plywood construction able to support the weight of two users (up to 600 lbs). The Outback includes interior baffle walls and interior air channels to provide adequate oxygen to the aerobic bacterium. Multiple colors are available. Finish is impregnated with sand for user traction and safety. All piano hinges are Stainless Steel. 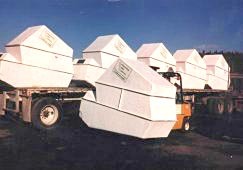 Toilets are made of cross-linked polyethylene and are virtually indestructible. Toilets are available in Handicapped sizes. Plastic seat and lids are air tight. Venting is 8" PVC pipe, removable, with 12V DC vent Fan. 12V power for the fan is provided by solar panels. 24 Hour venting is available. Tank is fitted with 1.5" Easy Drain system, optional.